In May 2011, the Supreme Court of the United States ruled that California must take far-reaching measures to cut down the size of its swelling prison population, the overcrowding of which has imposed unconstitutional punishment on its prisoners. In order to comply with the Court’s decision, California policy makers will have to choose between releasing its prisoners with shorter sentences, building brand new state prisons, and relocating prisoners to private prisons located throughout the U.S. in states like Arizona, Mississippi, and Oklahoma. As very few voters or representatives want to release prisoners into the general population, the Supreme Court ruling is likely going to spur a major increase in jail construction around the country. More prisons will mean fewer prisoners per prison and therefore less overcrowding, which is a scenario that will make everyone happy, including the Supreme Court. As prisons are often very large facilities, designers of state-run prisons and owners of private prisons are going to want to reduce operating costs by constructing energy-efficient prisons. The combination of prison overcrowding and state budget deficits is putting correctional facilities’ operating costs under the microscope. Energy efficiency measures will enable prisons – which by definition operate 24 hours per day – to significantly reduce their operating costs. Further, several energy-efficient technologies, such as LED lighting and centralized HVAC systems, give prison authorities the chance to optimally illuminate, heat, and air-condition prison cells while realizing significant EPAct tax deductions. Pursuant to Energy Policy Act (EPAct) Section 179D, private prison owners and primary designers of state prisons making qualifying energy-reducing investments in their new or existing locations can obtain immediate tax deductions of up to $1.80 per square foot. Chief Justice Kennedy’s majority opinion in Brown v. Plata held that California’s state prisons are so drastically overcrowded that it has become effectively impossible to provide prisoners with basic necessities like adequate medical care, food, and bedding, and the state is therefore denying prisoners’ their constitutional rights. The Court relied on the fact that the state prison system was designed to hold 80,000 inmates but in recent years has been holding as many as 156,000 as evidence that the system is in dire need of reconstruction. The high court’s decision also exposed major inefficiencies in California’s state prison system, such as persistent multibillion dollar budget deficits made worse by the high cost of keeping inmates imprisoned. Consequently, in order to remedy both the unconstitutional conditions imposed on California’s prisoners and the state’s budget woes, the Court has given California until 2013 to shed approximately 33,000 inmates in order to reach its target of 110,000, or 137.5% of design capacity. A panel of California state judges will now be in charge of overseeing how the state complies with the Supreme Court’s ruling, which will require a mix of releasing prisoners, transferring prisoners to local jails, transferring prisoners to private prisoners, and constructing new state prisons. EPAct provides tax incentives for the correctional facility design team that achieves the specific energy reductions targeted. Designer tax incentives are available for designers of federal, state and county correctional facilities. Of particular importance to prison facilities managers is the fact that energy-efficient lighting, and especially LED’s, provides a focused beam of light ideal for illuminating prison cells for the purpose of monitoring inmates. Additionally, fluorescent and LED lighting are well-suited for ligature or vandal proof lighting boxes, meaning that they are both high performing and safe for inmates. EPAct tax deductions of up to 60 cents per square foot are also available for both the HVAC system and the building envelope if an investment into either system reduces total building energy cost by at least 16.67% as compared to ASHRAE 90.1, 2001. Since a prison is a property category where occupant comfort (air-conditioning or heating) needs to be provided 24/7, HVAC is one of the biggest prison energy needs. To cool the building, correctional facilities often use chillers. If the correctional facility is less than 150,000 square feet, then the installed energy efficient chiller will most likely trigger an EPAct HVAC tax deduction . Correctional facilities exceeding 150,000 square feet that use very efficient HVAC system types, such as geothermal heat pumps or thermal storage, will typically generate large EPAct HVAC tax deductions . Prisons are ideally platformed for large HVAC deductions. Under EPAct 179D, residential buildings, including prisons, with centralized HVAC systems are given favorable tax treatment. Centralized HVAC provides the added bonus of minimizing access to in-cell mechanical equipment, which could be used inappropriately in the wrong hands. Two private corrections facilities dominate the private prison industry in the U.S. today: 1) Corrections Corporation of America (CCA) and 2) GEO (formerly known as Wackenhut Securities). The following table (Table 1) presents the EPAct tax savings potential for CCA’s existing facilities around the country. In addition to square footage within the cells, each of these properties contains a mix of office space for various staff members, medical examination rooms, cafeterias, recreational areas and storage space. Square footage estimates for each facility is based on an average of 240 square feet of combined space per inmate. 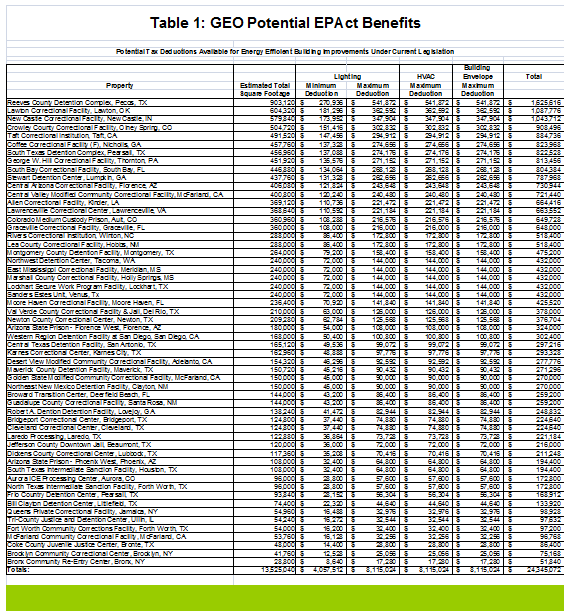 The EPAct tax savings potential for GEO is presented in Table 2 below. 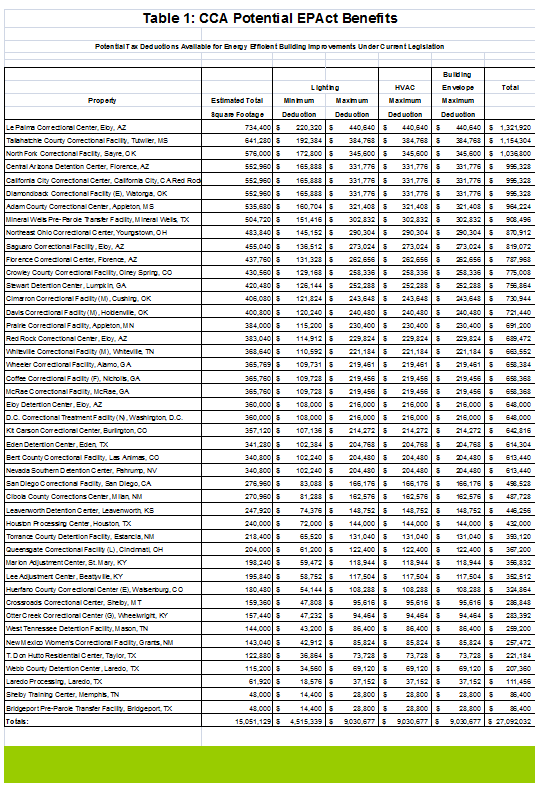 Information used to compile this table is accurate as for 2007, the last year for which information can be found. The Supreme Court decision in Brown v. Plata is going to have a significant effect on the U.S. prison landscape. 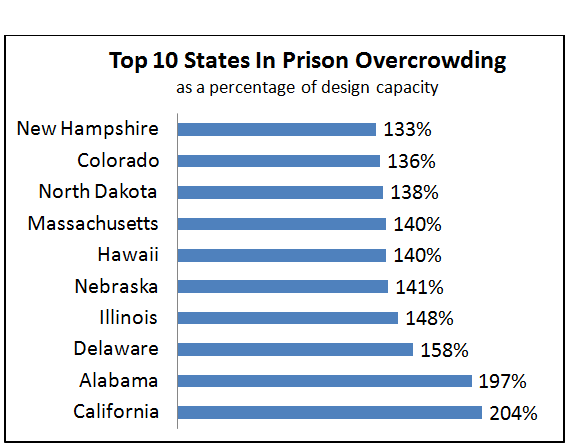 Both primary designers of state-run prisons and private prison owners are going to undergo major expansion, and will be under a lot of pressure to increase operating efficiencies. In the process of retrofitting their building to save on energy-related operating expenses, prison designers and owners will have the opportunity to realize large tax incentives.